More than 3,000 mark the death of the iconic leader of religious Zionism and first Chief Rabbi of Israel. More than 3,000 people visited the tomb of Rabbi Avraham Yitzchak Hacohen Kook on Friday, to mark 78 years since his passing. Rabbi Kook (more commonly known in Hebrew as "Rav Kook" or "HaRoe"h" - the visionary, an acronym of his name) was born in Griva, Latvia in 1865. He studied at the prestigious Volozhin yeshiva (religious academy), and soon became a renown prodigy, developing a close relationship with the Rosh Yeshiva (dean) and famous scholar Rabbi Naftali Tzvi Yehuda Berlin (known as "The Netziv"). By the time he was 23, Rabbi Kook had already assumed his first rabbinical post, during which time he published several articles concerning the Land of Israel which would form the basis of his later, more famous works. In 1904 he made Aliyah (emigrated to Israel) and became the Chief Rabbi of the port city of Yafo (Jaffa). He spent a brief spell in London and Switzerland, where he was stranded for several years during the First World War, and during which time he was involved in working towards the famous "Balfour Declaration" which recognised the right of the Jewish people to a national homeland in the Land of Israel. Upon returning, he was appointed as Chief Rabbi of Jerusalem, and then as first Ashkenazi Chief Rabbi of Israel (though the State of Israel had not yet been been born). Rabbi Kook’s was a poet and philosopher as well as a Torah sage - and most famously, his seminal work, Orot (Lights) - became a cornerstone of religious-Zionist life in Israel. He also founded the Merkaz Harav yeshiva and the Chief Rabbinate. 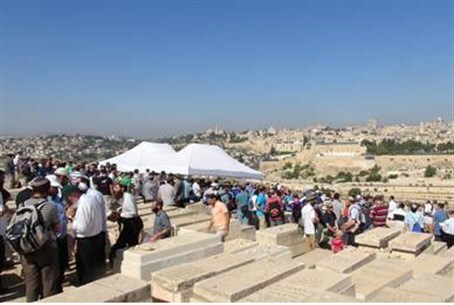 Rabbis and public figures were among those who visited his tomb in Jerusalem’s Mount of Olives (Har Hazeitim) cemetery. Among them were yeshiva deans Rabbi Zalman Baruch Melamed of Beit El, Rabbi Tzvi Tau of Har Hamor, Rabbi Yaakov Shapira of Merkaz HaRav, Deputy Minister of Religious Services Rabbi Eli Ben-Dahan, and Housing Minister Uri Ariel. This is the third year that there has been an organized ascent to Rabbi Kook’s tomb, and the first year that the Ministry of Religious Services has played a part in organizing the event.